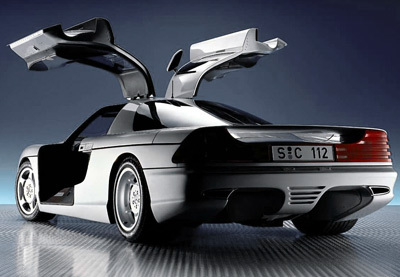 The Mercedes C112 prototype, which the company unveiled at the 1991 Frankfurt Motor Show, was basically a fully-functional rolling testbed which was used in the research and development of new vehicle technologies. As far as prototypes go the C112 was pretty fancy. 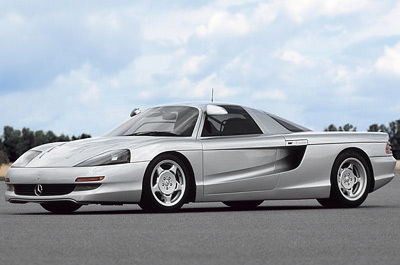 It had a supercar styled body, elaborate gull-wing doors, and a mid-mounted 6.0 litre V12 engine producing 408 horsepower. Top speed of the Mercedes C112 was an impressive 193 mph. Although in traditional German tradition, the top speed was electronically capped at 155 mph. 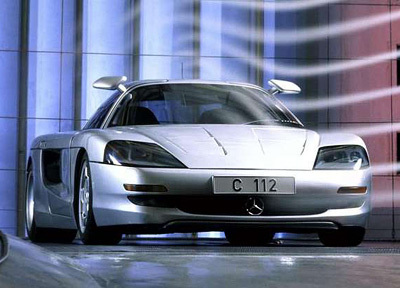 Some of the technology and gadgets which the Mercedes C112 concept helped to develop included tire-pressure monitors and radar cruise control. The car also featured computer controlled adaptive suspension, traction control, and an electrically adjustable rear wing which increased the car's stability at speed.